Classic Television Showbiz: Kliph Nesteroff presents Here's Milt Kamen! Kliph Nesteroff presents Here's Milt Kamen! This is the 1961 LP Here's Milt Kamen! from Capitol Records. Mel Brooks produced this album and it's his voice you'll hear at the very start saying, "And now... Milt... Kamen." Groucho Marx sounded his praises on the back cover liner notes. Maybe one day I'll write about Milt, but for now here's the facts you should know. Kamen was beloved by Groucho, Woody Allen and Mel Brooks. Author Bruce Jay Friedman says Kamen was his favorite stand-up comic. Same goes for Jules Feiffer. For a while Kamen dated CIA operative turned television executive Raysa Bonow. The legend goes that Carl Reiner discovered Milt Kamen and Milt Kamen discovered Woody Allen. Herb Sanford, a producer on The Garry Moore Show wrote in his memoir Ladies and Gentlemen The Garry Moore Show, "Milt played in the Philharmonic and in pit orchestras in Broadway shows. As he sat in the pit and listened to the jokes on stage, he began developing some ideas of his own and veered into television. Milt's comedy bits were far out. One of those he did with us was, one might say, science fiction. It dealt with a giant tomato that attacked an entire town. It ended happily, the victorious tomato "spritzing" a giant Bloody Mary." Jack Carter remembers Kamen in the days of the Sid Caesar program. "Kamen, the guy who did the run-through of those sketches was also a musician," says Carter. "He was a french horn player - Milt. And he was really the one that ad-libbed the sketches and set it up. He would do the dress rehearsal and Sid would save [himself] for the show. But Sid got plenty of shtick from this guy." 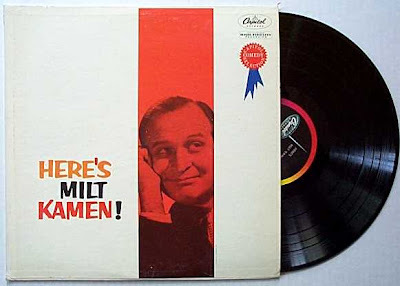 Now, enjoy the LP in its entirety - there are no Vietnam gags, but it's still fun: Here's Milt Kamen! Brilliant. Hasn’t dated in the slightest! Jace Gaffney: Brilliant! Hasn’t. Dated. In. The slightest.